Over the past week, I’ve been tasked with providing therapeutic respite care for a lively 14 year old. She will be staying with Nylia and I for another 10 days and celebrating her 15th birthday with us. First order of business was adding her to my YMCA membership. Her eyes lit up when I lead her to a Zumba class while Nylia and I hit the treadmill. Her favorite activity is Rollerskating. When she asked me to take her, I had no problems pulling out my professional skates. My Mom bought them for me 20+ years ago from Northland Skating Rink, located on Detroit’s well known 8 mile. I have yet to roll on a larger floor than Northland! Rollerskating was a major social event throughout my life, especially in high school. I think back on how lenient our parents were to allow us to skate from 8-11 pm on Wednesday nights. I would creep in around midnight and didn’t miss a beat the next day. It’s funny how one song can hold a thousand memories. One day I will have to write the soundtrack of my life thus far. One standout would be Slick Rick’s “Children’s Story.” At Northland, this was our famous “steppers only” song. Champs had a different approach to this beat with “advanced backwards skating.” The little kids were going way too fast. I was not trying to injure myself so that was the only time I stayed towards the middle. Most could recognize that I am not from Louieville with boot style skates. Detroit may be the only city in the midwest where speedskates are not as popular. Champs offered rentals that looked like moonboots on wheels. This skating adventure will more than likely repeat itself this weekend. It reminded me of how much I want to try speed skating. No rink offers it in Louisville, but I did find an ice rink in Cincinnati that is trying to get a team together. This entry was posted in Detroit, family, fitness, Louisville and tagged Champs Roller Rink, Northland Skating Rink, Rollerskating. Bookmark the permalink. How fun!! 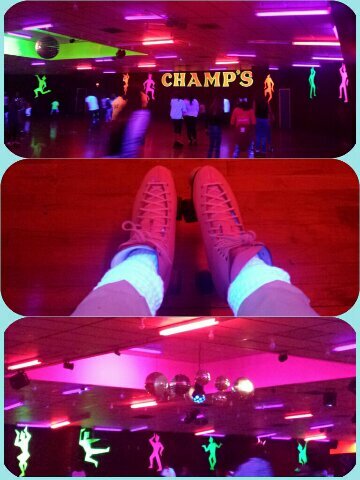 I haven’t roller skated in years. Of course, I was never any good at it. I was, however, quite the figure skater!! OK! I only did basic routines on the ice. I do enjoy outdoor ice rinks even in the dead of winter. I was in Dublin, Ireland a few years ago over New Years and I skated on the top of the big shopping center. I was one of three people out on the ice who could actually skate. The other two were skate guards! LOL!! OMGosh! That sounds like the experience of a lifetime! How fun! Roller skating was an every Friday thing for me in grade school. I hadn’t done it since high school until a few years ago when a group of friends organized an outing here in Dallas. Mistake was we went to happy hour first. I was ok, but several friends took spills – one broke her nose. Oooh wee! A co worker of mine was out for about 3 months with a broken ankle from skating and she has no memory of how it happened. We used to go so fast in Detroit that the guards made us go in the opposite direction. Roller skating is so fun! I have not been in forever!! You will feel it in your hamstrings when skating backwards. Great exercise!